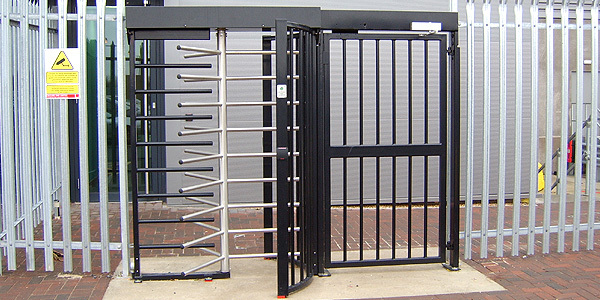 Although an excellent visual deterrent to intruders, barrier-style access systems can often be slow and frustrating for staff and legitimate visitors to use, especially if the entrance/exits experience high volumes of footfall, say in the mornings or at the end of the day.Turnstiles are the perfect solution for these scenarios. Access can be granted remotely (from a reception desk or check point) or via personal swipe cards, making turnstiles perfect for admitting large numbers of people quickly, whilst still providing a solid visual presence to your security measures. Our UK designed and manufactured turnstiles are available as single or double installations, in both half or full height options. Finishes can be chosen to suit your decor or branding, with stainless steel or a range of powder coated colours available. The majority of our turnstile access control systems are suitable for external use, including building sites and gate houses.